You are here: Home / Private Jet / Fly on a Cessna C340A Today! Fly on a Cessna C340A Today! Now you no longer need to get stuck in transit or traffic jams just to reach a nearby destination. By simply hopping on board a charter, you can speedily get to your intended location while enjoying aerial views during the flight. The Cessna C340A is your perfect go-to travel ally for those short term flights. If you’ll have a meeting, you can reach the place much earlier through reserving this aircraft. This way, you can get ready with your agenda and efficiently allocate your on-the-road travel time for more important matters. 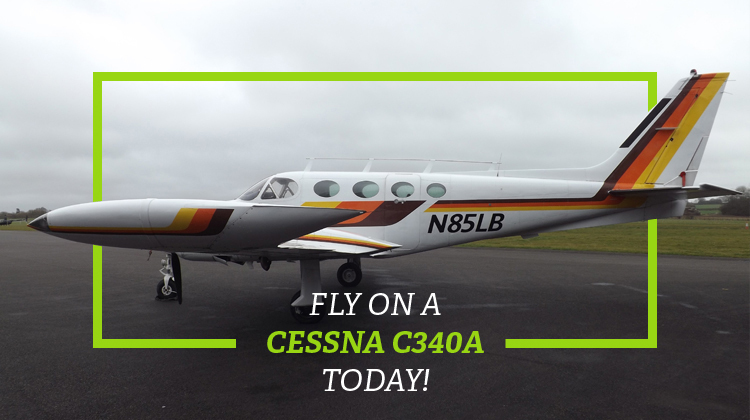 Leisurely travelers alike can reach their getaways fast, while on board the Cessna C340A. Meeting up with their pilot for a flight would already mark the start of their vacation as they see horizons and landscapes during the flight. Plus they don’t have to worry for gas pit stops and the other inconveniences related to on-the-road travels. The Light Twin Aircraft has indeed gone a long way since its first flight in 1970. With over a thousand of its units built, the Cessna C340A has become the household name among pilots and short flight travelers alike. The Cessna C340A can seat up to five passengers along with one pilot. It has a pressurized cabin along with a baggage capacity that’s sufficient for short flight travelers. The aircraft’s engines have a 285-horsepower capacity, making it feasible for you to fly at an economical cruising speed. Each of the aircraft’s seats also has enough legroom so you’ll be sure to stay comfortable throughout your flight. These days, the Cessna C340A is powered up with 3-bladed propellers, and the TSIO-520-NB engine from Continental Motors, Inc. The said engine also had its corresponding upgrades to fit the performance needs of its applications. It also varies in horsepower and is used by other Cessna jets, Beechcraft planes and other types of aircrafts. The American aircraft manufacturer, Cessna initially had the 310 twin engine monoplane as its flagship plane. However after three decades, the company deemed it was time to produce an upgrade of the said monoplane. Hence the Cessna C340A was born. This then-new plane was also set out to contend with Beechcraft’s Duke. Later on, the Cessna C340A eventually outsold the Duke as it has become highly demanded in the next decade since 1970. Since its development, the Cessna C340A had two engine upgrades to fit its required avionic technologies. From its first batch of orders during the early 70s, this aircraft’s production amount to over 1,300 units. It was also positioned to be among the lowest priced yet most efficient planes around.